Rachele has taken the time to share her mother’s private journal while she battled mesothelioma Here are some quotes that we discussed with her and wanted to share with the community. If you have a quote that inspires you, share it with us on Facebook, Google+ or Twitter. “Now I am getting stronger, taking fewer naps, having more energy, and I am depressed at how little I can do before getting all ‘tuckered out’ and also to be dependent upon others to do so many things for me. This is a good lesson, a real learning experience for a heretofore very independent woman. Rachele: My mother was a very strong person. I never saw her cry. Her journal showed me a very vulnerable and soft side of her that she kept very private. Rachele: I think that accepting things she couldn’t change was part of my mother’s way of coping with the things that were happening to her and her body. Ben: Many patients search for a balance of what their bodies are capable of after surgery or chemotherapy. This is great advice for anyone coping with cancer. Rachele: My mother was a very hard worker and slowing down was really hard for her to do. Taking time for herself was also hard for her to do. When I was in elementary school, we lived in a large house in the country in Vermont. My mother worked full-time as a legal secretary. In addition, she tended our enormous vegetable garden (with help from the family) and canned and froze the fresh vegetables from our garden to use in the winter months. She also did the grocery shopping, cleaned the house, did the laundry, did the maintenance and repairs around our house, and paid all the bills. She cooked all our meals from scratch and made homemade bread and other goodies. She also made braided rugs for our living room and dining room. She never complained or acted tired. She just made it all happen. So accepting physical limitations was extremely difficult for my mother. However, as difficult as it was for her to accept those physical limitations, I also think that because she was unable to do all the things that she felt she should do, that she finally slowed down enough to take some time for herself. In that respect, her physical limitations had a positive effect on her life. Ben: So much more information is available about mesothelioma now because of the Internet. What are some resources you have found now that you would recommend? 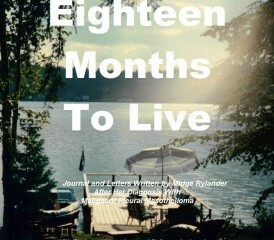 Rachel: In the back of the book “Eighteen Months to Live” are links to cancer resources that I would recommend. Ben: This is one of my favorite quotes that I have read. It portrays how she will not quit on herself. Rachele: This is a very hard thing for me to comment on because my mother chose not to have chemotherapy or any treatment other than pain management. So I think that when she said “whatever I can do, I will do” that she meant that she would do whatever she felt comfortable doing (which might not have been everything that possibly could have been done). She was a very determined woman and she fought her battle for her life her way. Ben: The playful imagery is uplifting. How do you think this has helped your mother cope? Rachele: Having a sense of humor and being able to find the humor in otherwise humorless situations is definitely a stress reliever for anyone. There is no question what mesothelioma can do to the body. But what cancer cannot do is change the person you are at the core. Thank you again to Rachele for sharing with the community. What do you think of these quotes? Is there more you would like to share?